Sony Smartwatch - Market Leading Style - Smartwatch This! For many industry commentators the most important development in terms of gadgets in recent years is the smartwatch. Essentially a miniature computer for the wrist, these clever and increasingly popular devices have their roots in the original digital watches of the 1970’s, but the technology involved is far removed from 40 years ago. The move from home computers towards tablets and hand held smartphones meant that further miniaturization was inevitable, and the result is the smartwatch. Among the most impressive models available is the SmartWatch from industry giants Sony, and it is this very neat design that has perhaps spawned the most imitations. 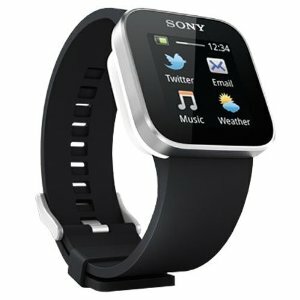 Android equipped and easy to use, the Sony SmartWatch is also sensibly priced and offers a variety of functions. Wearers can read emails on the move, as well as SMS messages and many other communications, and there are various options available, all from the handy Google Playstore. The SmartWatch also allows for calendar and alarm notifications, and will let the wearer know that something has come in – including Facebook updates – with a discreet yet notable vibration. Cleverly designed and available in two options, the SmartWatch stands up well in the face of very intense competition. The benefits of being an Android device are many; the Sony SmartWatch can handle a variety of apps, many of them free and available from Google, including music and video players and a choice of fun games. The process is easy, and installing is quick and efficient. A clear screen shows the incoming messages or graphics in full color, and navigating will be simple and familiar to anyone who already uses an Android device. One clever innovation is that the wearer can choose whether to have a digital style display or an analogue version. So does the Sony SmartWatch stack up against the rivals, and does it prove that the genre is something more than just a gimmick? Coming from Sony it meets with all the expectations of such a device, and features clever and innovative design in a stylish package. It is well priced – it will be interesting to see how it compares against the upcoming Apple iWatch – and offers excellent ability plus access to many apps. The SmartWatch is among the very best of the models we have seen so far and, while not offering the basic appeal of some others, may well be one that sets the standard for future competitors.